Artman clicked an RSS link and got a screenful of code instead of easy access to favorite news sources. He asked the Windows forum for advice. Whether it originally stood for Rich Site Summary or RDF Site Summary, there are good reasons why most people who use RSS think it stands for Really Simple Syndication. It's an extraordinarily easy way to keep track of your favorite news sites and blogs. Subscribe to an RSS feed, and you can scan the latest headlines and read the articles that interest you. Virtually every blog has at least one RSS feed, and magazine sites have many. For instance, the PC World RSS page lists over 50 separate feeds, including Latest News, Most Popular Downloads of the Week, Smart Phones, and, of course, Answer Line. How Do You Use This to Subscribe to a News Feed? and get a page full of code. Bad coding on the part of the site's developers caused this problem, but you can easily work around it. As LiveBrianD explained in the original forum discussion, just copy the URL for that page of gobbledygook, then paste that URL into the appropriate field in whatever program you use to read your feeds. 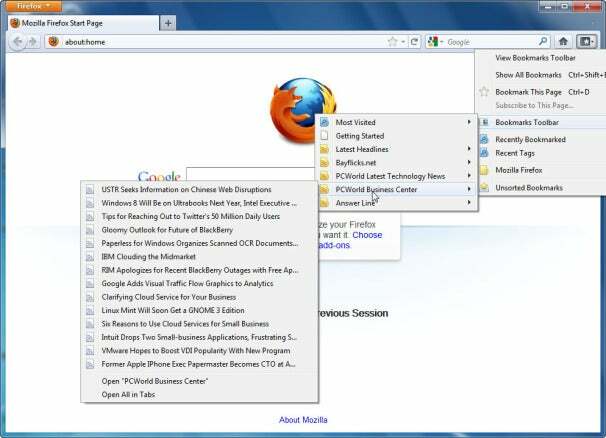 Internet Explorer 9: To subscribe, click an RSS link, then click Subscribe to this feed. You'll find your subscriptions in the Favorites pull-down menu's Feeds tab. Firefox: To subscribe, click an RSS link. From the "Subscribe to this feed using" pull-down menu, select Live Bookmarks, then click Subscribe Now. You'll find your links on the Bookmarks menu, with recent items appearing as cascading submenus. Google Reader: Chrome lacks RSS support, but Google's cloud-based RSS reader will work in that or any other browser. Email: You have a choice of services that can deliver RSS feeds to your inbox. I'm recommending feedmyinbox because it's simple and reliable. But it's not a good option if you need information quickly. It sends you posts for each feed only once a day. And I'm not even discussing the smartphone apps, here.